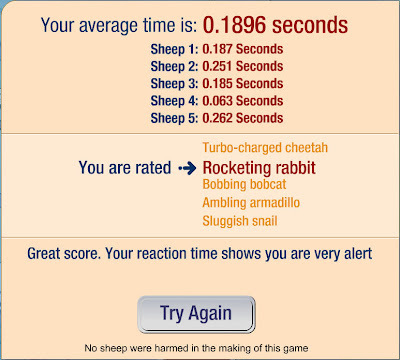 Try to beat my time in the sleepy sheep game. I was intrigued by an article with the headline Warning: Using a mobile phone while pregnant can seriously damage your baby. I think this is a bad interpretation of the study. To me, a more appropriate headline would be Parents who frequently use mobile phones pay less attention to their children. The implication of the "Warning" headline implies that the cell phone is causing a physical defect in the child. Of course, no one know the real cause of the study's finding. But certainly a behavioral cause is far more likely than some sort of physical effect.